Although Imagine It! 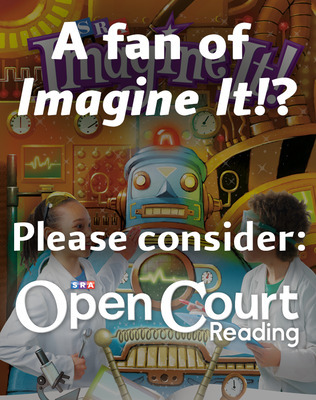 is no longer offered for sale to new customers, we’d like to introduce you to SRA Open Court Reading. SRA Open Court Reading is a curriculum you can trust that delivers a legacy of success spanning over 50 years. With an explicit, systematic approach to teaching, learning is exciting and engaging for all students. Learn more about SRA Open Court Reading. Not Affiliated with Imagine Learning’s elementary reading and writing programs.